CancerSEEK takes a multi-analyte approach to cancer detection. Victory often depends on good counterintelligence—and the war on cancer is no exception. Scientists have proven the value of circulating tumor DNA (ctDNA) and circulating tumor cells as informants, and the number of publications starring these double agents has rocketed skyward over the past several years. 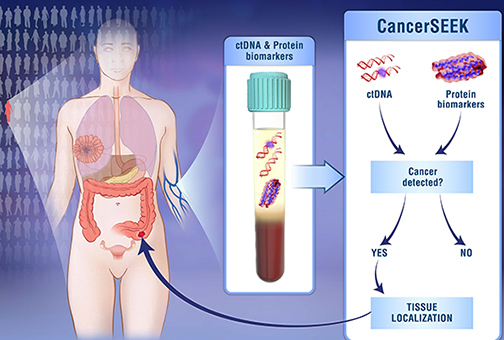 While “liquid biopsies” have the potential to improve clinical care for late-stage disease by providing clinicians with information on patient prognosis, treatment efficacy, and disease recurrence, research has also demonstrated their ability to alert clinicians to tumors before standard screening methods—allowing earlier intervention and, ultimately, saving lives. Several companies—including Grail, Illumina’s billion-dollar spin-off—have entered an arms race for earlier detection of these sentinels, and now a team of researchers at Johns Hopkins Kimmel Cancer Center has made significant strides in the search for oncology’s so-called holy grail. Described in a recent Science article, entitled “Detection and localization of surgically resectable cancers with a multi-analyte blood test ,” the team’s blood-based diagnostic, CancerSEEK, marks a new milestone for early-stage cancer detection. On average, the test detected 70% of cases in a 1,005-patient cohort diagnosed with eight common forms of non-metastatic tumors including breast, colorectal, esophageal, liver, lung, ovarian, pancreatic, and stomach. The test’s sensitivity ranged from 33% in breast cancer to 98% in ovarian cancer. Together, these eight cancers account for an estimated 360,000, or 60%, of cancer deaths annually in United States, and no screening methods currently exist for five of these. The researchers applied the law of diminishing returns to optimize their panel of genetic mutations by identifying the minimum number of short DNA sequences, or amplicons, that would allow them to detect at least one driver mutation in each of the eight tumor types. They observed a plateau in detection sensitivity around 60 amplicons, and exceeding this number, the authors claimed, would increase the probability of false positives without a substantial increase in sensitivity. Armed with an optimized 61-amplicon panel, the team used an immunoassay platform to whittle their list of 41 protein biomarker candidates down to 8 that proved particularly useful for distinguishing cancer patients from healthy controls.